When it comes to the pipes in your home, it seems like there is an endless list of things that can go wrong. Plumbing systems are incredibly complex and pipes get finicky as they age and wear out. Almost anyone you ask, homeowner or renter, will be able to tell you a nightmare story about a plumbing disaster that they have experienced. Many people believe plumbing repairs are too expensive and don’t recognize the value of hiring a professional so they attempt to do the repairs themselves. Unfortunately, attempting to DIY a fix can often lead to more problems down the road. While there are some issues that can be easily fixed by a handy homeowner, there are other jobs that should be left to the trained professionals. 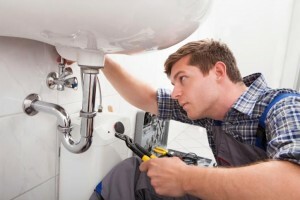 In this guide we’ll give you an overview of some of the most common plumbing issues, their causes, and whether you should call a professional plumber or attempt to DIY. When faced with plumbing repairs many homeowners wonder if they should try to DIY. Learn about the most common plumbing problems and when to call a plumber. While Draino can be a great option for clearing out a slow-moving drain in a pinch, many homeowners rely too much on drain cleaning chemicals to clear recurrent clogs that should be fixed by a professional. These chemicals are best used to clean out built up residue and clear out small clogs but their harsh nature makes them difficult on pipes and over time they can cause your pipes to wear out and corrode. You must always make sure to use drain cleaners in the right application. While most sinks and bathtub pipes will be able to handle heavy-duty cleansers, toilets and washing machine drains may not be equipped to withstand the chemicals and they can cause permanent damage. Be sure to always read the label on your product before applying to ensure you don’t end up with even bigger problems than a simple clogged drain. These chemicals also contain a number of ingredients that are bad for the environment and pollute our waterways when they are rinsed down the drain, threatening delicate ecosystems. Before using drain cleaner, try a gentler and eco-friendly alternative by pouring ½ c. of baking soda down your drain followed by 2 cups of white vinegar (prepare for an explosion of foam!). Once the bubbling has died down, pour a kettle of boiling water down the drain and run the tap for a minute or two to see if it worked. If you have a persistent issue that one use of drain cleaner doesn’t fix then it’s best to call in a professional. Our plumbers will be able to thoroughly inspect your drain and recommend the best course of action to fix it, whether that be a simple drain clearing procedure or a full repair job. No matter the repair, having a professional plumber come in to fix your slow-moving drain will be much easier on your pipes than frequent use of corrosive chemicals and may save you money in the long run. A trained, professional plumber will be able to find and fix the cause of the problem rather than simply treating the symptom, ensuring a much longer-lasting solution than a DIY approach. A dripping faucet can waste up to 20 gallons of water per day! While it’s hard to believe that such a seemingly small problem could have such a big impact, leaking faucets will run up your water bill and every day that you let the leak continue you are letting more of your hard-earned money literally wash down the drain. You can use this interactive calculator to find out just how much water your leaking faucets are wasting. Faucet leaks are incredibly common so knowing how to deal with them can save many headaches later. If the leak is dripping from the head of the faucet itself then the most common cause is a worn out O ring or washer in the stem of the faucet. The repair will depend on what kind of faucet you have but you can often fix it yourself. Begin by shutting off the water underneath your sink to ensure you don’t accidentally cause a flood and then block the drain with a washcloth so that you don’t accidentally lose a piece. Carefully remove the handle from the unit, unscrew the packing nut, and then unscrew the stem. You will then see the seat washer and O ring. Remove these and take them to the hardware store with you to ensure you get the right size to replace them with. Install the new O ring and washer and then put everything back together in the order that you removed it (taking pictures of each step of disassembly as you complete them will help you remember what goes where). Turn the water back on slowly just in case you did something wrong to avoid a geyser in your bathroom. Some faucet types are more complicated to repair and it can be tricky to disassemble and keep track of all of the little parts and pieces. If you are unsure of your DIY abilities it is always best to call in a professional who will be able to save you a headache by quickly addressing the problem and ensuring that the job is done right. Just remember that whether you choose to DIY or call for help, always fix a leak as soon as you notice it. As soon as the days start to get chillier it’s time to start thinking about a major homeowner headache: frozen pipes. A neglected frozen pipe will burst, causing thousands of dollars in water damage to your home and requiring a professional plumber’s attention. Avoiding frozen pipes in the first place should always be your top concern. One common mistake many homeowners make is to keep their garden hoses connected in the winter. Unfortunately the cold exterior temperatures can freeze the water inside the hose which freezes up your interior pipes and can cause them to burst. Before winter comes be sure to disconnect your hose, turn off the shutoff valve, and open the spigot to be sure that all water is drained from any pipes that will experience frigid outdoor temperatures. Proper pipe insulation is crucial and a trained professional plumber can help you identify whether your pipes are adequately insulated to protect them from freezing temperatures. In the case that you do experience a frozen pipe, you may be able to fix it yourself. If you know exactly where the pipes are frozen and they are in an accessible location, you may be able to thaw them using a hair dryer or a small portable heater pointed directly at the pipes. Leave your spigots open so that you will know as soon as water starts flowing again (even a drip is a sign that you’re headed in the right direction!). However, if your DIY efforts don’t work quickly then call a plumber right away. Burst pipes can cause thousands of dollars in water damage to your home and are expensive to replace. Save yourself the headache by bringing in a professional who will use a special heat gun to thaw your pipes quickly and efficiently. Don’t you hate it when the water that should be gushing from your faucet slows to a trickle? If only one faucet in your home is showing this problem then the issue is probably a clogged aerator, a repair that any homeowner can do themselves. Simply remove the current aerator from your faucet and rinse under clean water to clear it of any build-up and debris. Also take a look at the O ring inside and if it looks worn out, go ahead and replace it. If the water pressure in your whole house is low then you’re facing a much larger issue that you will not be able to address on your own. This indicates sediment build-up in the pipes themselves which may require having your pipes serviced. If you have noticed that none of your tubs or sinks are filling up as fast as you’re used to then it’s time to call in a professional. This entry was posted on Wednesday, September 9th, 2015 at 7:58 pm. Both comments and pings are currently closed.